Hydraquip is Tasmania's leading Fluid Power Service Company for design, manufacture and commissioning of high quality fluid power systems. We also distribute an extensive range of quality hydraulic, pneumatic, and lubrication products, hoses and fittings, and many other fluid conveying products. Hydraquip stocks a huge range of accessories. Our commitment to our customers is second to none, and our service is excellent! Hydraquip only supply products of a high quality and always strive to ensure that prices are very competitive! At Hydraquip, we have supplied, manufactured, installed, tested and repaired many types of hydraulic and pneumatic systems. Located in Tasmania, you can find Hydraquip in Launceston, and our great products are available Australia wide through our network of resellers. If it’s aquaculture, agriculture, industry or mining … Hydraquip is your first port of call for all your hydraulic and pneumatic fluid system needs. 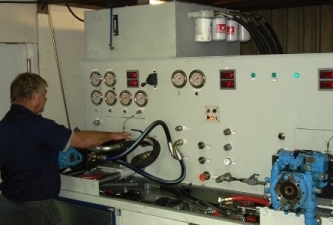 Hydraquip … 27 continuous years of providing quality fluid power services in Tasmania.